Kihāhouna Heiau is a walled temple that once stood 130 feet by 90 feet. The heiau was dedicated to four gods of great significance to ancient Hawaiians: Kāne; Hulukoki, a bird god; and Ku‐hai‐moana and Ka‐moho‐alii, two shark gods. Three hala‐lihilihi‐ula trees situated on the outside of the naupaka hedge mark the heiau perimeter. Kihahouna symbolizes these four gods, their mana (life force) and their hā (breath) that sustains this special area. The nearby condominium resort, Kiahuna (a key to a sacred place) Plantation, derives its’ name from this heiau. Legend suggests that the second chief of Koloa. Kiha‐ke‐oho‐lupalupa (Kiha with the luxuriant hair,) erected a walled temple here, which covered 90 feet by 130 feet and was terraced toward the south and west. Portions of the temple platform were still evident more than 20 years ago until wave action from hurricanes in 1982 and 1992 eroded the site. Although the temple no longer stands, according to ancient religion and to present day Hawaiians, the mana (llfe force) of the ʻāina (land) still exists. 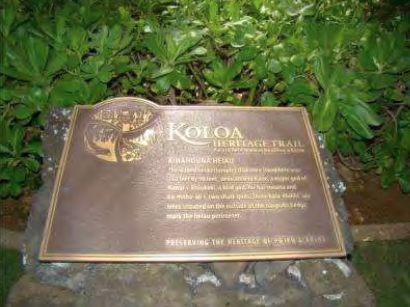 The Kihahouna Heiau is also a part of the Kōloa Heritage Trail, a route that leads through the Kōloa‐Poʻipū Beach area highlighting culture, history and natural beauty.